Is your cat not too psyched about bathtime? Cats' aversion to water is widely accepted as fact -- but in truth, not all cats feel the same about taking a dip. One domestic breed, the strikingly beautiful Turkish Van cat, actually delights in getting wet. His ancestors did, too, plunging into lake waters to better cope with the extreme summer heat in the Lake Van region of Turkey, where the breed originated. If a cat's experiences with water are mainly exposure to a sopping rainstorm, a forced bath or being sprayed with water as a disciplinary measure, why wouldn't she shy away from water? Scientists contend that cats' dislike of water comes from house cats' owners shielding them from the elements since the earliest periods of domestication and from their ancestors -- wild cats in Europe, Africa and China's desert cat -- whose limited experience with water did not require adapting and evolving to deal with it. Lions and leopards avoid river-dwelling predators (like crocodiles) by staying away from water. On the other hand, some big cats in the wild, especially those in hot, arid areas, regularly swim and bathe to stay cool or catch dinner. The Asian fishing cat is a skilled swimmer, with partially webbed paws, that dives to nab its prey. Despite not enjoying a full immersion, many house cats are fascinated by water, dipping an exploring paw into the water bowl to scatter a few drops or running into the bathroom at the sound of a shower. A dripping faucet is a cat magnet, an interactive toy that draws playful paws eager to catch a drop or two. But even without a drip, a cat may gaze at a faucet, hoping to see a trickle. Author Susan Conant, known for her mysteries starring dogs, also wrote "Scratch the Surface," in which she described a fictional Chartreux cat's encounter with a faucet: "How long can a cat safely go without water? The question never occurs to Brigitte, who nonetheless jumps to the kitchen counter, scampers to the sink and trains her amber eyes on the faucet. Just in case." For cats fascinated by water, flowing pet fountains that recirculate water in a continual whirl are great fun, and a good way to get them to drink more. 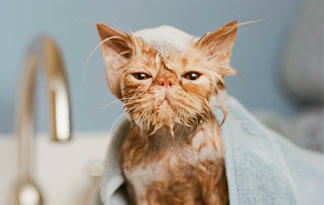 Unlike dogs, cats rarely need a bath because they do so much self-grooming. But if yours gets into something sticky or smelly, or has a skin condition that requires bathing, you'll want to help Kitty cope with the watery experience. If you begin bathing a cat when he's young, he will grow accustomed to the feeling of water. Place him in an empty tub or sink, speak reassuringly, and run a washcloth wet with room-temperature water over his fur -- just enough to get him damp. If he's calm enough, start filling the bath or use a tumbler or pitcher of warm water -- never hot -- and slowly pour this over his fur. You can also try a hose attached to the faucet to saturate his coat. Working from head to tail, apply a small amount of diluted feline shampoo and work up the suds, cleaning the cat's fur and skin. Be sure to rinse more than once to prevent shampoo residue from irritating his skin, or getting into his mouth when he tries to lick himself dry. Dry him with a clean, fluffy towel, praising him for braving bathtime.